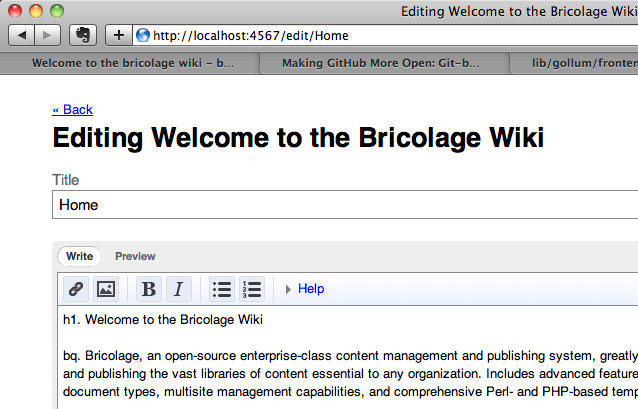 Last night I upgraded the Bricolage wiki on Github to the new git-backed wiki that Github rolled out last week. May sound like a trivial thing and not worth a blog post, but it’s quite the opposite, actually — the changes are (almost) revolutionary. The first really interesting thing about the upgrade is that all of a project’s wiki pages are now simple text files in their own git repository. Now I can update these pages anyway I like, in any one of several markup languages, including POD. On it’s own, that’s pretty useful — now I can clone a project’s wiki along with the project itself and submit changes back as I would any other changes via Git. The second interesting thing about the upgrade is the offline viewing and editing tool that Github released called Gollum. This is a small Ruby on Sinatra application that — when run in the git-backed wiki repository — runs a local copy of the Github wiki that can be used to view and edit those wiki pages offline (see screenshot above). On a final note: I remarked to Theory last night that I hadn’t played with RubyGems for a while and I was impressed at how painless and easy the Gollum installation was. He pointed out that ‘gem install’ almost always runs without any tests (unlike the cpan client). I did make me wonder about the best way to distribute a “mini app” like Gollum within the current Perl ecosystem of mini tools and micro frameworks… perhaps cpanm plus Mojolicious::Lite could create a similar “no brain required” installation?